The Photography Skill comes with The Sims 4 Get to Work expansion pack. From a phone to a fancy camera. Sims who are skilled in Photography will have greater success as they hone their skills by taking lots of pictures, upgrading their equipment, experimenting with picture settings and using the In a Flash Photo Studio. Take photos of one Sim or 2 Sims. You can take photos of adult Sim but you also have the option to take photos of kids. When you are taking the picture you will have the option to choose filter, size or a backdrop but you can’t change poses if you are taking the photo. To change the pose you need to take a new picture. You can buy 3 different digital camera’s: Barely Better Digital Camera, Crystal Clear Digital Camera and the Appreciably Average Digital Camera. The higher the price the better the digital camera. Do a number of things with Photos taken, such as hanging them on walls, selling them in retail stores, or converting Photos to Memories. You also have the option to give the photo a name. Use your phone or digital camera to take photos or selfies. Money can be made from a Photo Studio by taking pictures with others in it. You can take a Thoughtful Shower to get a +1 Inspired moodlet. You can also take a picture and create a Memory from it that will give you an Inspired moodlet. The Postcards collection gives off an Inspired aura or you can buy one of the Plumbob lamps: Shine On Ambitions Award or Enchanted Aurora Supernatural Award. When you are taking the photo you have different filters to chose from. These are Grayscale, Sepia, Oversaturate, Undersaturate, Vignette, White Vignette, Invert, Warm, Cool, Bright and Dark. After you take the photograph you can still change the filter if you are not happy with it. Only poor quality photos can’t have their filter changed after the photo was taken. Photos can be converted to Memories using the option Add to Memories on the Photo. Players can tag each of the Sims that appear in the Photo. An emotion can also be associated to the Photo, which will bring back fond memories when Sims choose to reminisce about the Photo. How can you create a Memory from a photo? Do this by clicking on the picture and choose ‘Add To Memories’. Now go to Camera Control in the right corner of your screen and click on the option ‘Memories & Pictures’. Choose a photo and choose a memory for that photo. If you choose inspired it will help leveling your Photography Skill. Click on the thinking cloud ‘Reminisce about this Memory’ to get this moodlet immediately. If you want to run a Photography store you will need the In a Flash Photo Studio. This allows you to take Photos of up to two Sims using a camera on a tripod. Different types of backdrops can be used to set the mood. 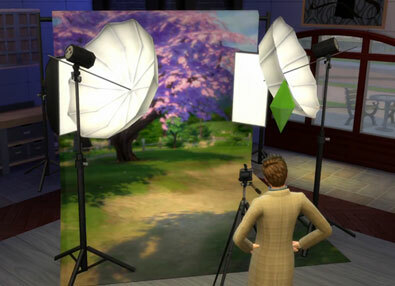 This is especially useful for Sims who would like to make a few extra Simoleons by taking quality Photos. You can choose between these backdrops: Black, Brick Wall, Grey, Outdoor, Party, Sky, Water and White. The Photography skill only has 5 levels and doesn’t really unlock anything. The only thing it does is that you can take better quality photo’s you can sell for a higher price. Photography skill will allow to capture the world around. The road to creating photographic masterpieces takes some time but the higher the skill level the better photos. The quality of the camera matters! Cheaper cameras are great to learn with but spending a few more Simoleons buys a camera that can zoom and take larger pictures. You can earn extra Simoleons by taking pictures of other Sims using the In a Flash Photo Studio. Open a photo gallery to share (and sell) photography art with other Sims! Discover the Photography skill with unique options and take group photos. There is also a cheat to max your Sims Photography Skill. Use the Cheat Console by pressing CTRL+SHIFT+C. Input the cheat code below to max out your skill level. If you don’t want to max your skill level you can change the number 5 with the preferred skill level from 1 to 4. How do you screenshot the pictures you have under level 5!? “Take pictures with…” but it’s not letting the adults and the teens have that option at all. And also, people from different age range can’t take pictures together….pls someone HELP!!! !